If you try your hand at the art of decoupage, eventually you will have to face the problem of air bubbles. As the paste and paper dry, a bit of shrinking occurs when the moisture evaporates, which can cause bumps and bubbles, even if the decoupage was perfectly flat when wet. Though air bubbles are not entirely avoidable, they can be minimized and sometimes removed. You can decoupage both porous surfaces such as wood and nonporous surfaces such as glass. In either case, the surface must be completely clean so the paste will adhere properly, minimizing air bubbles. Even if your object appears clean, wash it or wipe it with a damp cloth. When applying decoupage to wood, sanding the surface first can help the paper adhere -- just be sure to thoroughly wipe away all of the resulting dust before continuing. Using too much decoupage paste will cause problems with bubbles and is more likely to cause the paper to buckle. Apply the thinnest layer you can on both sides of the paper. Burnishing can be as simple as pressing the paper flat with your fingers, or you can use a burnishing tool. Commercial burnishing tools are inexpensive pieces of plastic or bone shaped like a thick letter opener with rounded edges rather than sharp ones. Rub the tool over the surface to push out any air bubbles. Without this step, expect bumpy decoupage. Because decoupage pastes dry by the evaporation of water, the more humid the day, the slower it will dry and set. This can be problematic, because the longer the paper stays wet, the more buckling can occur. Avoid decoupaging on humid days, or do it in a dry, air-conditioned setting. Decoupaging is not a good outdoor activity for several reasons, including the possible interference of wind and dirt; humidity is also a big reason to keep your decoupage work space indoors. If you notice tiny bubbles appearing on your previously perfect decoupage as it dries, they can be remedied with a quick prick of a pin. Simply pop each bubble with a straight pin. This technique works best if you catch the bubbles early. If the decoupage is too dry it won't work. 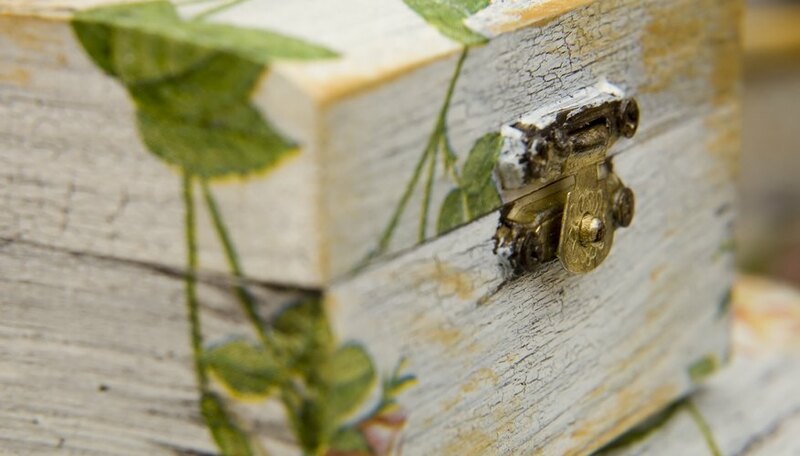 Although it may be tempting to fuss with your decoupage constantly as it dries, many air pocket imperfections will work themselves out as the paste dries and sets. This is especially true if you've created more than one layer of decoupage on the surface. Allow the piece to sit for a day or two to allow the paper to settle in place.